While selecting a bronzer for oily / acne prone skin, you need to be sure that it doesn’t contain any of the highly comedogenic ingredients. Today’s post covers non-comedogenic bronzers available in India. A bronzer is used to achieve a sun-kissed look. In English it means that you look beautifully tanned and glowing like you’ve been enjoying the sun. It can warm up pale or dull complexions. You might wonder – why would I want to look darker or tanned? It is not so much about looking darker as it is about adding a definition and glow to your face. Used on dark skin, it can add a definition to the face and bring a healthy glow. If your skin is very dark, you might invest in a highlighter product. We’ll cover that in later posts. On wheatish skin tones, a bronzer with a hint of shimmer looks good. A matte bronzer, on the other hand can be used for contouring the face – such as a thinner nose, pronounced cheekbones and a slimmer face. If you fear over-application, swirl your brush on the bronzer, then swirl it on a compact powder to kind of dilute it, then apply to the face. Maybelline Eye Studio Diamond Glow eye shadow palette in Copper Brown (Rs. 375) fine shimmer The two middle brown shades can be used as bronzers depending on your skin tone. This palette is mostly non-comedogenic with talc being the only mild culprit. It is economical because it doubles up as eye shadow, bronzer and highlighter all in one. 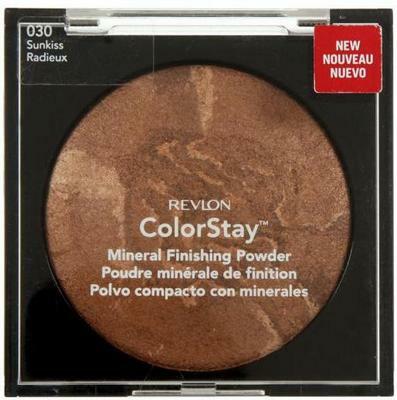 Revlon Colorstay Mineral Finishing Powder in Sun Kissed Bronze (approx. Rs. 1450) fine shimmer This is talc-free, but is becoming harder to find. It seems to be getting replaced with the Aqua Mineral Finishing Powder. Colorbar Shimmer Bar (Rs. 950) pronounced shimmer Contains talc, tocopherol, mineral oil and petrolatum among mildly comedogenic ingredients. If you break out easily, skip this. Will work well for APST 2. Faces Sparkle Dust (Rs. 332) pronounced shimmer Look for the bronze shade in here. They are non-comedogenic as far as I can tell. Maybelline Dream Matte Mousse (Rs. 600) matte bronzer for contouring or sculpting the face Maybelline Dream Matte Mousse used to have a bronzer shade earlier, but it has now been discontinued. Choosing a Dream Matte Mousse 2 shades darker than your skin tone should still do it. NYX Matte Bronzer contains ethylhexyl palmitate which is comedogenic. If any of the popular BB creams has broken you out, this bronzer almost certainly will. NYX Bronzer Powder contains corn starch which doesn’t go down well with acne prone skin. It may still work for you, but just so you know. Lakme Absolute Sun-Kissed Bronzer – without the ingredient list it is hard to say if it is non-comedogenic or not. Lakme Gold Dust Shimmer Bronzer – without the ingredient list it is hard to say if it is non-comedogenic or not. Colorbar Shimmer Magic in Mesmerizing Bronze – contains ethylhexyl palmitate which is comedogenic. If any of the popular BB creams has broken you out, this bronzer almost certainly will. This is a round compact, different from Colorbar Shimmer Bar mentioned above. I’m going to leave you with a bronzing tutorial.